Welcome to PartnerOn with Arrow! We are very excited to offer you a new marketing program to support and accelerate your business. Arrow has built this program in collaboration with ContentMX. 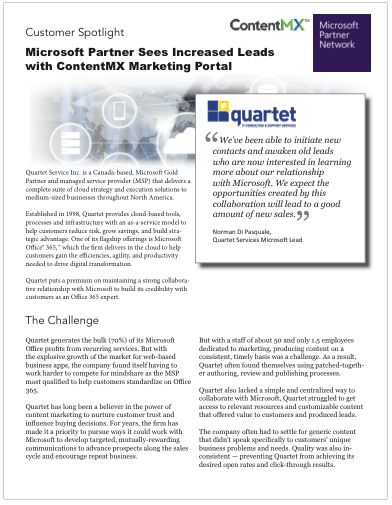 ContentMX has worked closely with partners in the channel for almost 20 years. PartnerOn (formerly Odo) is free of charge, and we expect it to help increase your business influence – and revenue. PartnerOn gives you access to consistent, relevant, and customizable content to share with your customers and prospects in just a few clicks. Improved relationships and engagement with prospects. Ready to learn more and get started with your own PartnerOn with Arrow account? Register for a “Getting Started with PartnerOn Webinar” – every week! We will discuss the PartnerOn program, how to set up and start using your account. Check out our Resource page for more information on setting up your account, how to get started, and how to share the content with your customers and prospects via email, on your website, and on social media. Again, we are very excited to be working with you, and look forward to helping you drive important business results with PartnerOn. To get started with PartnerOn, join one of our weekly Webinars. Click below to select a webinar time and register to attend. Or, click below to view the on-demand Webinar which has been recorded for you. Sign Up Now – It’s Free! Let’s get started with PartnerOn! Choose a username and we will email you a temporary password. Your account will be ready to go in just a few minutes. Then, join one of our weekly webinars to learn how to make the most of your new PartnerOn account. Please select a username. Usernames may be a combination of 3 or more letters and numbers and cannot include punctuation or spaces. Having trouble getting your temporary password? Make sure you add partneron@contentmx.com to your address book to ensure prompt delivery of your password and the regular weekly emails. Or, email partneron@contentmx.com and we can re-send your temporary password. Read this Getting Started with PartnerOn document to help prepare you for account setup. Learn what you need to know. View these Working with PartnerOn videos to learn how to make PartnerOn a part of your weekly marketing.